...maybe I didn't fail. I really don't think I failed. 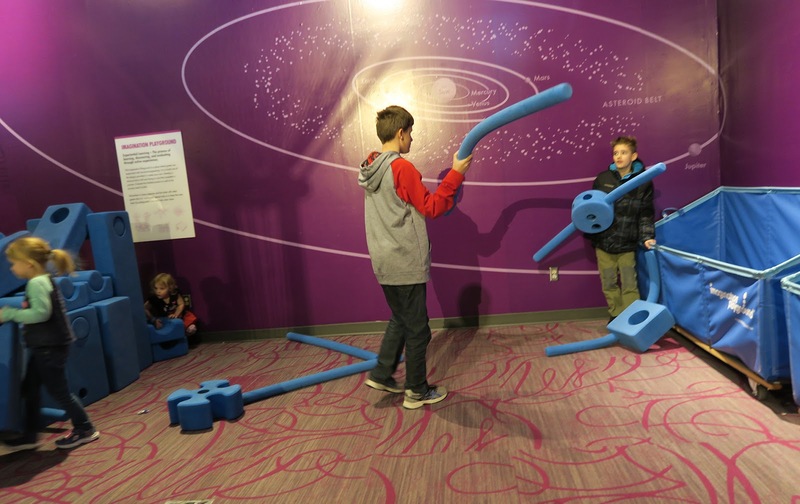 We were visiting a museum, and there were these big foam pieces. The boys were fighting with them. I'm like, "Well that's not what they are for, but it's the most fun they've had all day." Travis and I let them do it. Bad Mom! – Possibly! I don't think so. I have to say I grew up with sisters. I've learned that wrestling is how boys play. I read a book called, Raising Cain. It's a great read by the way! I'm not the type that reads lots of literature, and follows the literature to raise my children. This book was recommended to me by someone that bought a sculpture from Travis. We connected, so I gave the book a try. Raising Cain is all about raising boys. It's written by two Ph.D's. The funny thing is, when they interviewed boys in their office, the office below wondered what they did in there. They weren't quite! They let them wrestle, build with Legos, jump up and down on the floor and couch, and they made sound effects. They knew that boys love tools, and how wrestling isn't fighting to them. They also knew that for boys to express themselves they have to be active, while doing it. So many boys are unable to tell anyone how they feel because parents/teachers and so on are always telling them to, "Stop! ", "Knock it off! ", "Quit making noise!" and so on. I'm not saying that I never say those things. I do. The boys had enough of those key words above that day that we went to the museum. It's icy and cold outside. They can't do much running around/noise making that they like to do. Travis has handed Mica boxing gloves, and Isaak Hulk Smash gloves to battle it out in the cold outside. That only lasts so long because...it's cold. 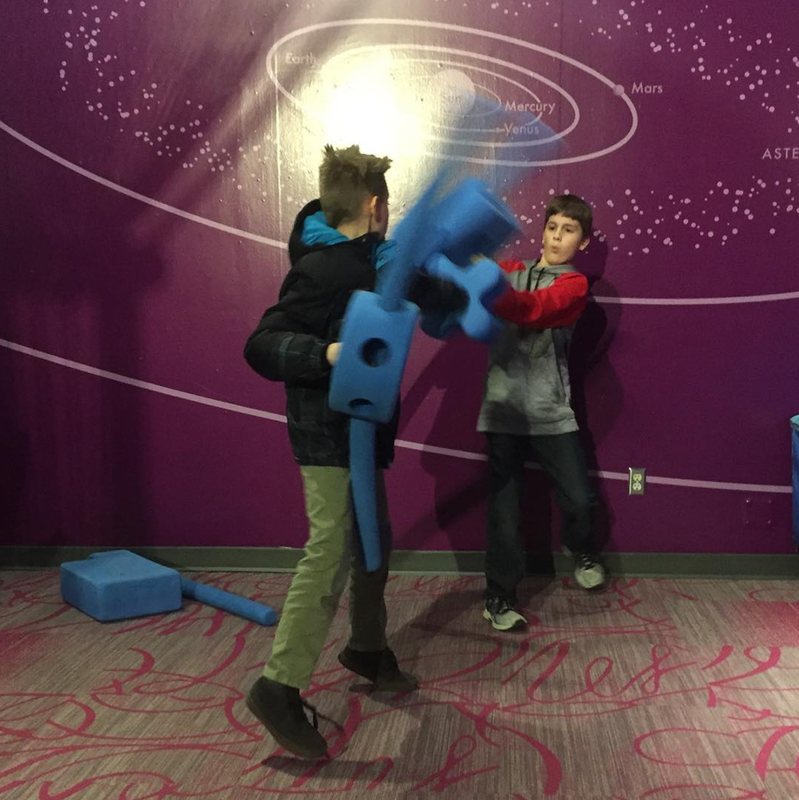 When we were at the museum and they saw the opportunity to fight with big foam pieces. We didn't stop them. They weren't near any other kids. It was the most fun they had all day! Isaak had to go to the bathroom. Travis took him away, while I stood by to make sure nothing happened to Mica. Mica quickly went to a computer screen to see what another little kid was doing. Another boy came up after mine were gone and treated one of the foam pieces like a weapon. His Mom said, "No No honey. You can't play with those like that! You know better." I was sitting there all guilty like! No blood, no problem – right? Are my boys disrespectful? If anyone would have asked them to stop fighting with the foam pieces they would have! Ask any teacher and they'll tell you they are great kids. Isaak has the gift of gab at times. He's creative and smart. Mica has great conferences. In fact sometimes I wish they'd find more wrong with him, so we could have stuff to work on. They both help cook, clean, take out the trash, bring up laundry without too many complaints. When I find paper airplanes, and piles of Legos on the floor I don't complain. That means they are creating. If the pile of Legos gets out of hand where it migrates to their dressers, when I ask, they'll pick them up. 1. Boys like to destroy things. 2. Boys need men and women to look up to. 3. Boys make sound effects much of the time. They can be pretty loud. 4. Little boys (Isaak) can be hoarders. 5. No matter if you get into weapons or not, they will make weapons out of things. 6. They make toys. Yep boxes and paper towel rolls are toys. Hand these throw away items over to boys, and they'll find something to do with them. I really liked this post. You shouldn't worry at all. You didn't fail, you did right. I have a book called "Honor and Violence in the Old South." It has a full chapter about raising boys in the pre-War South. Up until they got to be about ten, it was entirely the woman's responsibility to raise the boys, and they "minded" her. But at age ten the father took over, and after that, the only influence the mom's had was moral influence, they couldn't "order", only cajole. And this in a society where males were expected to fight at the drop of a hat, over any insult real or imagined. Now those ladies had challenges! Yesterday I was walking past the twins room and stopped when I saw what they were doing. They had taken all the pillows and blankets and stuffed animals of their beds to make a pile. And they were jumping off the top bunk into the pile. I don't know where they come up with this sort of stuff! I did make them so their fun but only because I knew someone would eventually get hurt. I am the mom that gets annoyed with the wrestling... just because when the big boys are here... it is NON STOP 24/7 and it gets old.. fast. Agreed on all accounts, especially the weapons thing. My boys (even the grown ones) love NERF, water guns, whatever... it wasn't a big deal years ago, now people are so very touchy about any kind of weapon. I understand it, but like you said too, it's part of growing up, if you're a boy.